There are only a handful skateboarders comparable to the caliber of Geoff Rowley. He’s awe-struck the skateboarding community with more than legendary street video parts, whole parts filmed of only backyard miniramps (Volcoms „Chicagof“), is part owner of Flip skateboards and has released countless iconic Vans pro-models. Speaking of which, due to its popular demand, one of the most influential models, the OG Rowley Pro, has even been reissued recently. 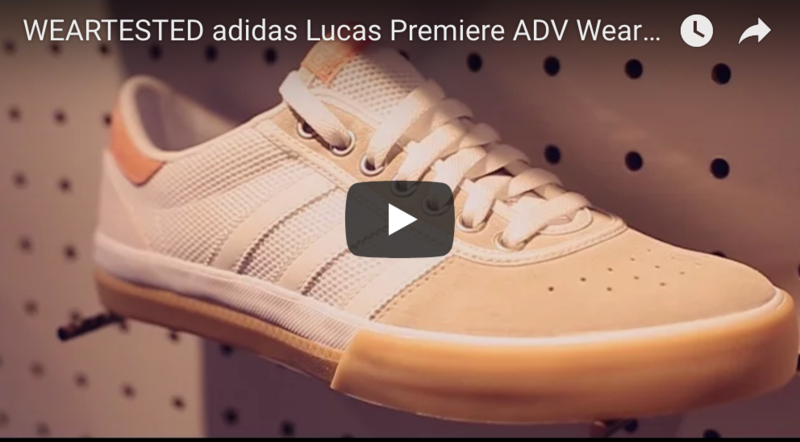 Although keeping it original was the secret ingredient to Van’s success, footwear innovations and technological advancements did not go unnoticed. The result is the new Vans Rowley Pro Lite, supposedly one of the most innovative model in Vans’ current footwear line. We tried out the Rowley Pro Lite and checked whether this promise stands to be true. The Vans Rowley Pro Lite fits true to size. 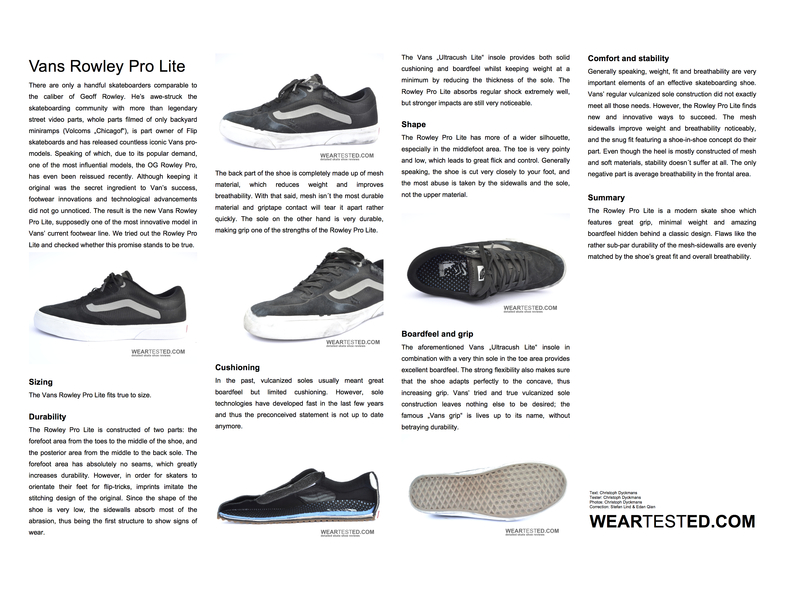 The Rowley Pro Lite is constructed of two parts: the forefoot area from the toes to the middle of the shoe, and the posterior area from the middle to the back sole. The forefoot area has absolutely no seams, which greatly increases durability. However, in order for skaters to orientate their feet for flip-tricks, imprints imitate the stitching design of the original. Since the shape of the shoe is very low, the sidewalls absorb most of the abrasion, thus being the first structure to show signs of wear. 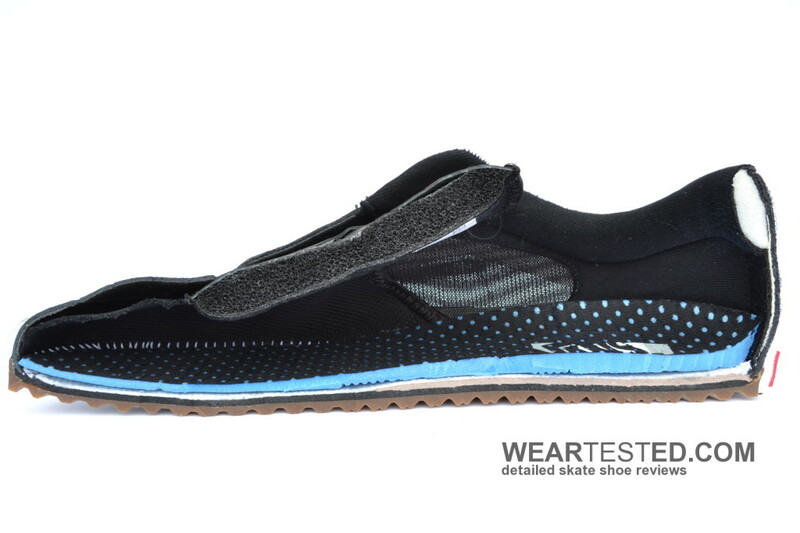 The back part of the shoe is completely made up of mesh material, which reduces weight and improves breathability. With that said, mesh isn´t the most durable material and griptape contact will tear it apart rather quickly. The sole on the other hand is very durable, making grip one of the strengths of the Rowley Pro Lite. In the past, vulcanized soles usually meant great boardfeel but limited cushioning. However, sole technologies have developed fast in the last few years and thus the preconceived statement is not up to date anymore. The Vans „Ultracush Lite“ insole provides both solid cushioning and boardfeel whilst keeping weight at a minimum by reducing the thickness of the sole. The Rowley Pro Lite absorbs regular shock extremely well, but stronger impacts are still very noticeable. 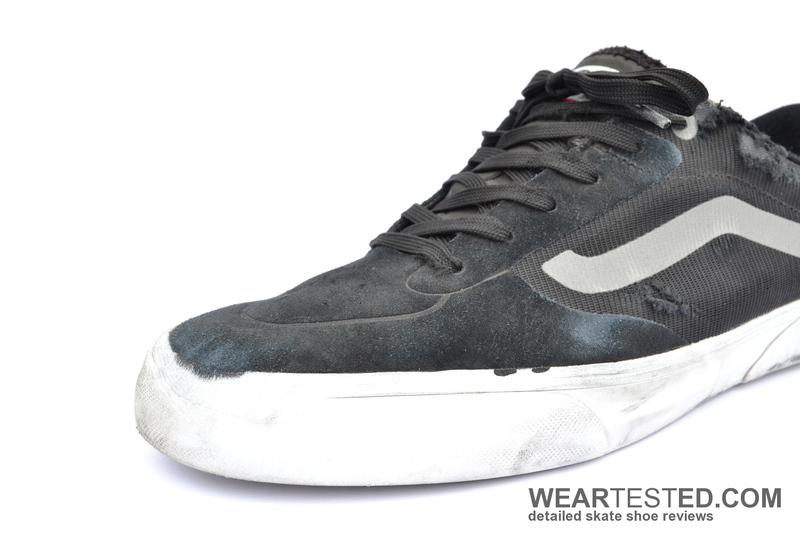 The Rowley Pro Lite has more of a wider silhouette, especially in the middlefoot area. The toe is very pointy and low, which leads to great flick and control. Generally speaking, the shoe is cut very closely to your foot, and the most abuse is taken by the sidewalls and the sole, not the upper material. The aforementioned Vans „Ultracush Lite“ insole in combination with a very thin sole in the toe area provides excellent boardfeel. The strong flexibility also makes sure that the shoe adapts perfectly to the concave, thus increasing grip. 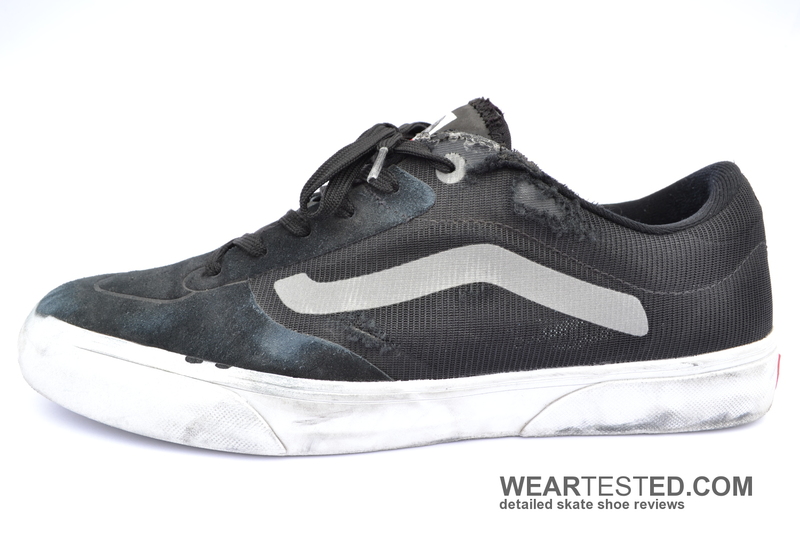 Vans’ tried and true vulcanized sole construction leaves nothing else to be desired; the famous „Vans grip“ is lives up to its name, without betraying durability. 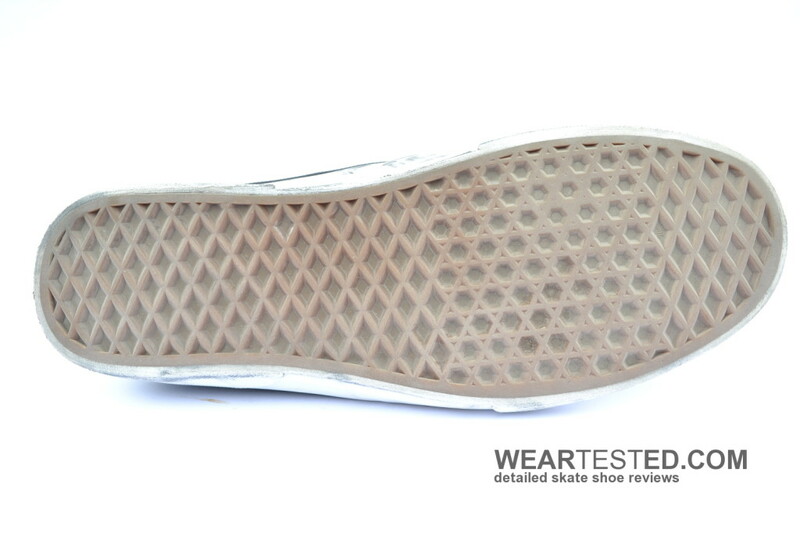 Generally speaking, weight, fit and breathability are very important elements of an effective skateboarding shoe. Vans’ regular vulcanized sole construction did not exactly meet all those needs. However, the Rowley Pro Lite finds new and innovative ways to succeed. The mesh sidewalls improve weight and breathability noticeably, and the snug fit featuring a shoe-in-shoe concept do their part. Even though the heel is mostly constructed of mesh and soft materials, stability doesn´t suffer at all. The only negative part is average breathability in the frontal area. The Rowley Pro Lite is a modern skate shoe which features great grip, minimal weight and amazing boardfeel hidden behind a classic design. Flaws like the rather sub-par durability of the mesh-sidewalls are evenly matched by the shoe’s great fit and overall breathability.